If you’re looking for a pretty side dish for brunch, a fun preschool snack, or something for the kids after school, try these simple pear cups with cheese cubes! Breakfast on the patio, anyone? 5 minutes for each set of two pair halves (Note: try to prepare these cups just before serving. I made mine about an hour before serving and that was fine, but any longer and the pear will brown and the cheese might get soggy from the pear juice). 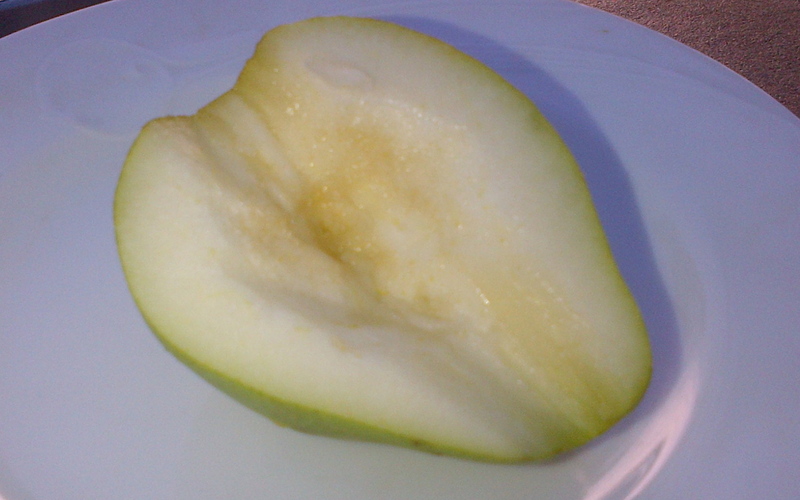 The pear cup, ready for cheese cubes. Cut up the cheese blocks into small cubes and arrange the cubes inside the pear cups, piling the cheese as high as possible. 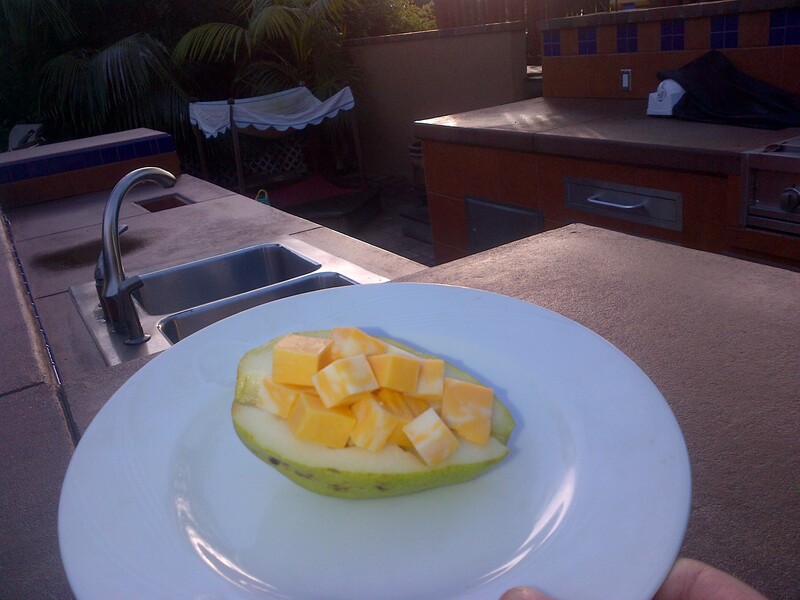 Serve ASAP but you can refrigerate them for an hour or so before serving if desired. You can either eat the cheese and the cups separately, or enjoy them together for a tasty treat! They were super easy to do and a big hit with the four-year-olds and their teachers. Lucky for me my mom was in town and she helped me prepare the pirate flags the night before I needed them. She made a simple flag shape template and traced and cut out all the flags. She used glue to adhere them to the tops of the toothpick “masts.” On the morning of school, I cut all the apples and cheese slices, and my kids volunteered to assemble the ships: one apple slice stacked with one cheddar and one white cheddar, all speared with the toothpick mast. We had a blast working together and it was very satisfying to see our fleet of pirate ships! These pirate ships would soon be sunk by a mob of hungry preschoolers. While this snack was one of the least nutritious, I think the kids enjoyed it the most! 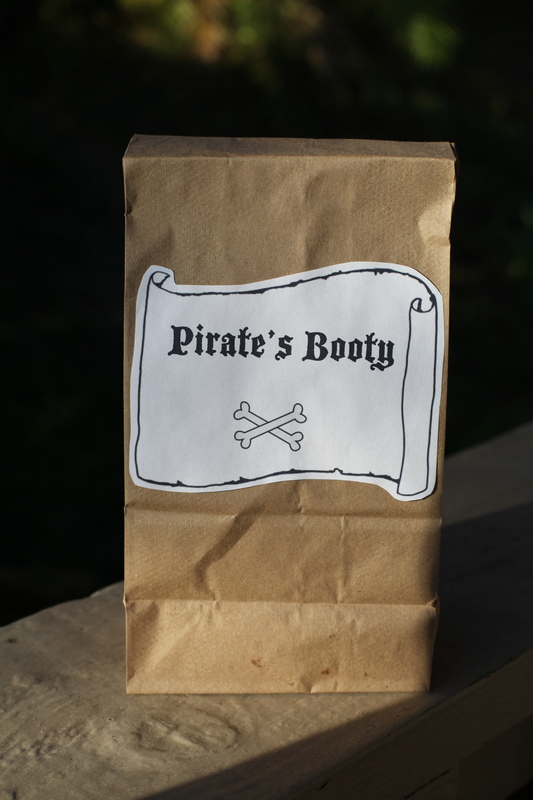 My nutrition motto is “everything in moderation” and that includes Pirate’s Booty, the puffed rice and corn treats. I chose the aged white cheddar variety. Good news on the allergy front: Pirate Brands’ products are produced in a nut-free facility and thus are peanut and tree-nut free. Again, my mom helped me print and glue the labels on the bags in advance. All I had to do on the morning of school was scoop the servings into each bag and fold down the top. 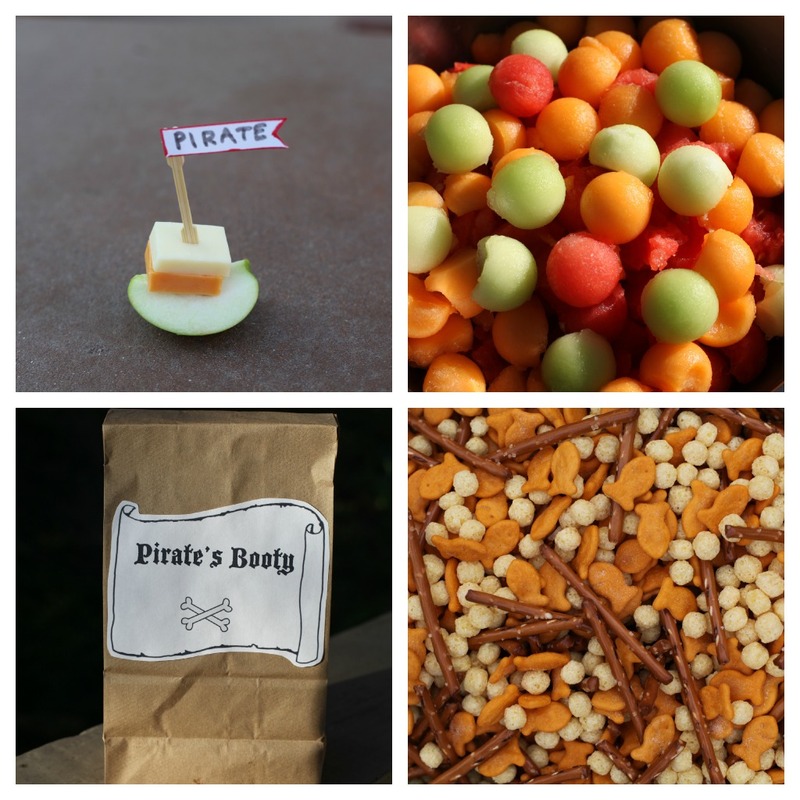 This pirate snack wins the award for most beautiful. If you have the time, energy and skill to go over the top with the pirate theme, you could carve the watermelon into a pirate ship (Google “pirate ship watermelon” and you’ll see some incredible examples). I stuck to the basics and just served the melon cannonballs in cups. My preschooler reported that these cannonballs achieved a direct hit. 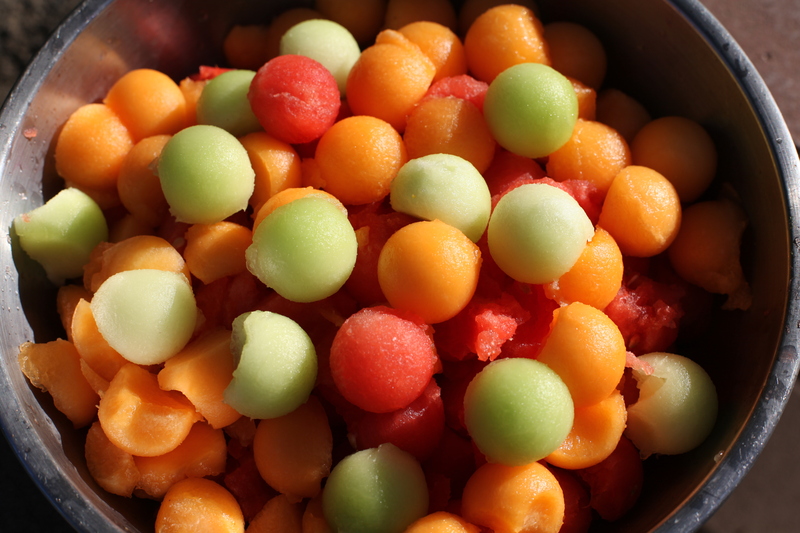 She did say that “some kids only liked one color [watermelon] but some kids liked all the colors [cantaloupe and honeydew too! ].” Thank goodness I’d erred on the side of including more watermelon than the other melons. By the fourth day of making pirate snacks for 14 people, I was happy to just open the above containers, mix everything together, and parcel it out into cups. Easy-peasy. A little sweet, a little salty, something to please everyone. Two other cute ideas I saw on the web involved pirates walking the plank. The first was ants on a log — take a slice of celery, fill it will peanut butter and top it with raisins (one of my favorite snacks although I decided the preschoolers might not like it the best and I didn’t want to send peanut butter to school. You could substitute SunButter for a peanut-free alternative). Another cute idea was making a plank out of a long cookie topped with a Teddy Grahams teddy bear with an eye patch painted on it in chocolate icing. Note that the applicable child care laws in California require that preschool snacks include servings from at least two different food groups. Any snack that didn’t include two food groups was served with organic milk instead of water. Yes, I am a rule follower. 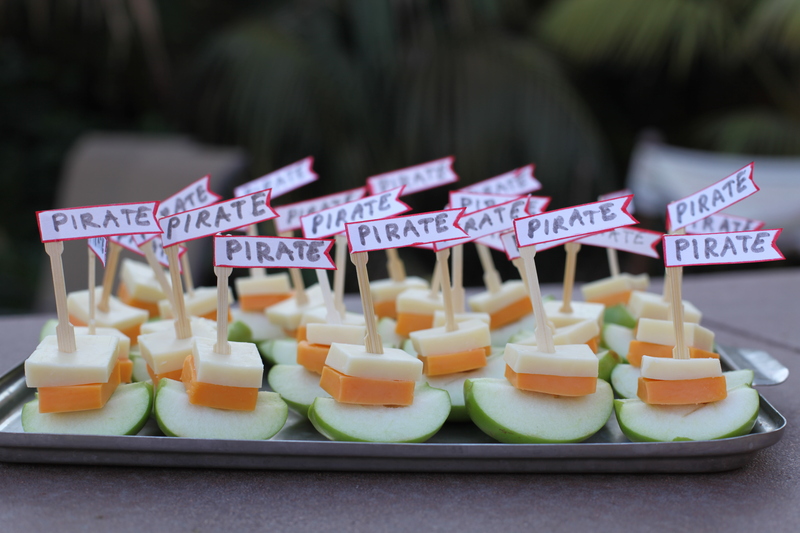 Do you have any pirate-themed snack ideas to share? 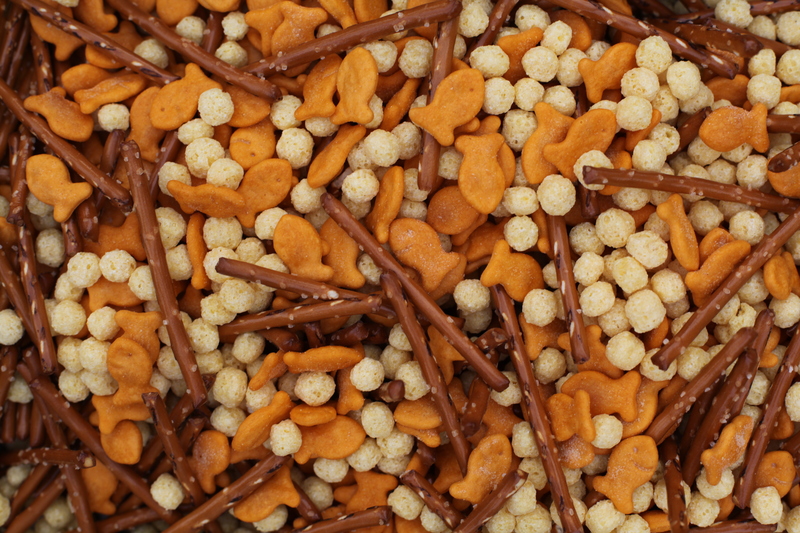 How do you make snack-time fun? I think getting the kids involved in choosing and/or making whatever you plan to serve is the best way to ensure they’ll eat it.